The OnionThe top of The Onion’s homepage is currently nothing but stories mocking Facebook. Over the last two days its published around a dozen articles, taking aim at everything from tech addiction to the 34-year-old CEO’s baby daughter. The Onion’s editor-in-chief told Business Insider the attack is because of how Facebook has “betrayed the trust of billions of people” and is cutting off publishers’ web traffic. The Onion is in the business of making jokes about pretty much anything in the news. But this week, the satirical news site appears to have trained its fire on one particular target: Facebook and its CEO Mark Zuckerberg. Over the last two days, The Onion has published around a dozen articles ridiculing the social network and its founder, and it says there’s more on the way. One of the first in the barrage on Thursday poked fun of the 34-year-old CEO: Mark Zuckerberg Insists Anyone With Same Skewed Values And Unrelenting Thirst For Power Could Have Made Same Mistakes. Another Onion article skewered Facebook’s arguably cringey “Here Together” campaign: Facebook Users Ashamed Of Criticising Company After Seeing Heartwarming ‘Here Together’ Ad Campaign. After that came a flurry of more jabs at the Facebook CEO. Facebook has been a semi-frequent target of The Onion and its sister sites like Clickhole in the past – but never so frequently. So what’s The Onion playing at? Nackers was highly critical of Facebook in his statement, calling it “an unwanted interloper between The Onion and our audience. He cited how the publication’s Facebook fans “receive an ever-decreasing amount of the content we publish on the network” – That’s most likely a reference to Facebook’s News Feed, which only shows a publisher’s posts to a certain number of that publisher’s followers. Companies can pay Facebook to “promote” their posts so that they reach a larger number of their followers. But it’s possible that The Onion is also complaining about recent changes to Facebook’s algorithm, which have deprioritized news articles in favour of other types of Facebook posts. And given that The Onion’s satirical articles are in a sense a form of “fake news,” the company’s content may be getting penalised more severely than that of other publishers. “We are strong proponents of the First Amendment, and the fuel of a functioning democracy is the free flow of information. Facebook, the world’s largest sieve of personal data, has become an unwanted interloper between The Onion and our audience,” the editor said. 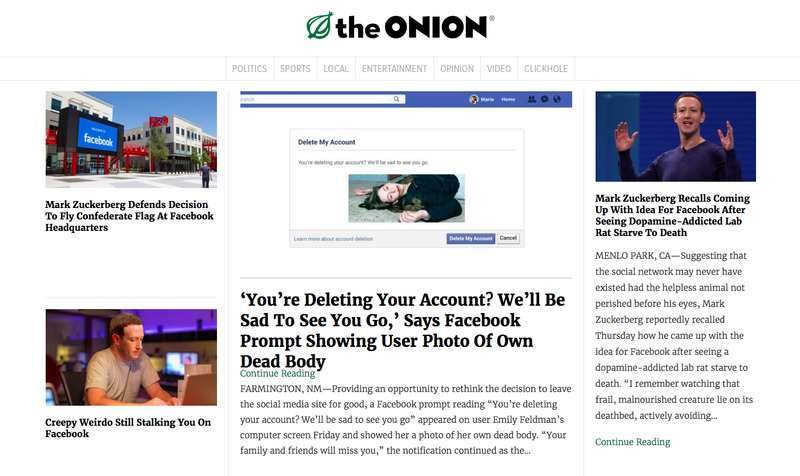 The Onion’s anti-Facebook crusade is also branching out into multi-media. On Twitter it shared audio that purports to be Mark Zuckerberg and his colleagues making fun of a teenager’s coming-out message on the social network. And it shared a video too: 6-Year-Old Explains How Messed Up It Is That Her Entire Life Has Been Put On Facebook. Facebook, perhaps unsurprisingly, did not respond to a request for comment.